I could hardly put to words what I felt when I filled out the survey. Now days later I still can’t. I was nervous and excited, it was a flood of information, the 26 is intimidating to someone that just found out about sailing. There was a time when I just had to say “Hold on guys! Your telling me, one person can operate all this at one time?” As I looked at them with doubt Randon smiled and said sure. In seconds he tacked and adjusted the sails in a fluid motion. The way these guys treated me and communicate in multiple ways made this process work. This class brought everything into perspective. I will be back. I felt like part of a sailing family. Randon & Clint were my long lost brothers! I walked away with a new perspective on life! It was so helpful reading the book and going through the online course before coming to Ft. Myers. The quizzes online and in the book were very helpful. I loved the visual aids in the classroom too! The magnetic boats on the board and the model of the Colgate 26 were huge in helping me visualize the content. Course slides were great. Just the right amount of classroom time, too. All in all, A+! Joelle knew her material inside and out and was very good at explaining the classroom content clearly and concisely. She was also magnificently calm while I was quietly freaking out onboard our afternoon sails. We went over Crew Overboard and heave-to drills multiple times – so, so helpful to one who has come to sailing in 2nd half of life! Fantastic experience. I have some sailing experience but I learned soooo much. Joelle is the best instructor I have ever encountered. She taught our family of 8 with different learning styles and different abilities and experiences. We had a GREAT EXPERIENCE! Haley wrote: Loved the experience. Our instructor was fantastic. He is patient, knowledgeable, and adjusts his teaching style to customize and fit the needs of students. The location is beautiful. Will take our next course with Offshore Sailing. Mahala wrote: It was a great experience. I’m very shocked by how much I learned in such a short amount of time! I would definitely come back and I look forward to continue sailing! My instructor was great. He always made sure we understood concepts and important facts. Also he made sure we felt safe in any situation. I really think this is a great school. I wouldn’t change a thing! 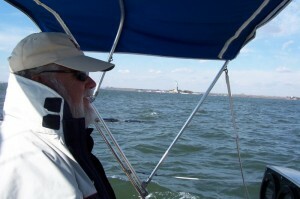 Phil wrote: The course was the quintessential introductory sailing course. The boat was sound, nimble and forgiving. The material was comprehensive yet simple. The accommodations were luxurious. Most importantly, the instructor was top-notch and first rate. He was caring, experienced, knowledgeable and fun. It was obvious that sailing was his life and that he wanted to impart that experience. Helen wrote: To celebrate our 25th anniversary we decided to take this course. I’m very proud of this milestone. Something appropriately significant is a tall order. 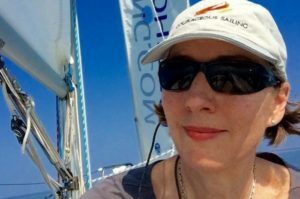 Learning to sail, opening a new chapter – a new adventure – in our lives seemed it might be exceptional enough. It was. We ‘re extremely excited, renewed, and can’t wait to sail more. We loved learning to sail and virtually every single thing about our overall experience was fantastic. I recently took a motorcycle course and test. The instructor had world class racing experience, but her teaching skills were average. Steve Huff is an example of how world class experience and knowledge is so much more valuable when an instructor also has extremely high quality teaching skills, interpersonal skills and obviously love teaching. He was very positive, kind and fun. You are lucky to have him. Excellent employees makes or breaks excellent companies. 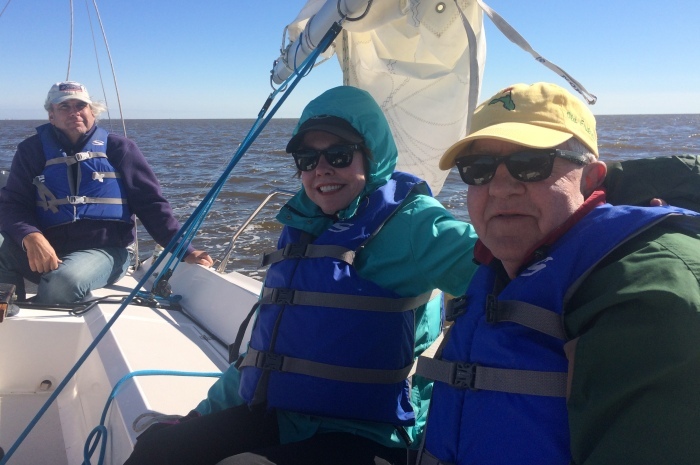 I spent a weekend in St. Petersburg on the Basic Keelboat Course with Instructor Mike and he was, hands down, amazing. Not only did he exceed all expectations, he went so far beyond anything I could have hoped for. The classroom instruction prepared me for the written exam and Mike was great at honing in on difficult concepts with practical explanation while at sea. We had some great winds and decent-sized swells this weekend and I never once felt uneasy. Where most instructors would want to take over the helm, Mike continually assessed the ocean and kept me in control of the boat the entire time! He understood that the best way for me to gain real-world experience is to handle the boat in the difficult conditions. Thank you so much!!! Thanks, too, to the awesome, caring, and amazing Sales Associate I worked with. I’ll see you in the BVI in January for the Live-Aboard Course as well!!! Abby wrote: This 5-day course far exceeded my expectations! It was extremely effective with a perfect pace and great instructor! Would highly recommend to anyone looking to take this course. Randy wrote: Absolutely a great time. Learned so much. Father-daughter trip that I will cherish forever. Boat was very good. South Seas is wonderful. Instructor is wonderful A+++; best instructor I have ever had. Knowledgeable, patient and very helpful in all aspects. James wrote: Our instructor, Suzie, was wonderful – professional and fun. Attentive but relaxed. The boat was fun and easy to learn on. And the resort service was very friendly. Kelly wrote: My fear is gone!! Suzie’s own personal experience and stories and her ability to share them made learning exciting and fun. Her patience and constant examples made things easier to soak in and retain. Hands on experience 1st in the classroom makes it way less of overwhelming experience. Robert wrote: I had an excellent experience. Mike was very patient and knowledgeable in presenting the material and answering our questions. 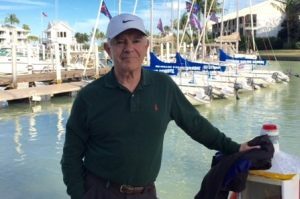 He provided a sound foundation for us to build our sailing expertise. The sailing was truly a time when the classroom came to life and the material and content made sense. 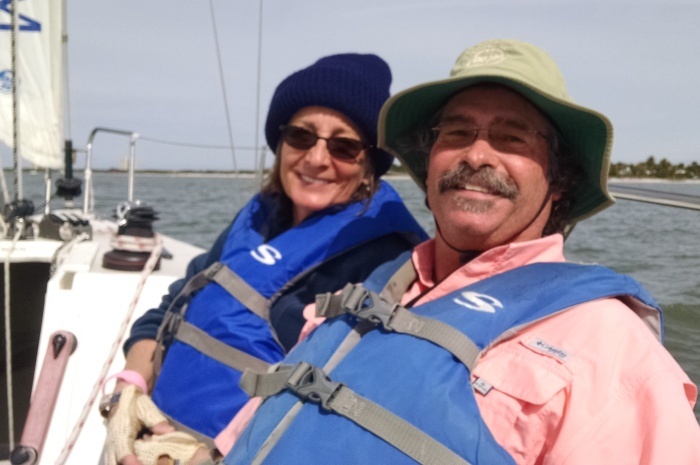 Mike was very patient and his knowledge and experience brought sailing alive. He was thoughtful in his lessons and encouraging us to provide feedback on his answers. Kathleen wrote: Not all experts in their fields can teach their knowledge to others. Mike can. He is able to translate complex concepts into step-wise learning using simple language and analogues so that it is not overwhelming. Mike is patient, he waits for the learner to figure it out unless . . . in the sailing portion he needs to step in quickly to correct a student’s action. Even then he is calm, courteous and uses it as a learning opportunity. I felt safe. I am a physician from Canada. This course was outstanding. Extremely easy to sign up, cordial on the phone, all questions answered, fabulous instructor, lovely boat, plenty of sail time, excellent free time. We feel absolutely ready to sail our 31 footer we just bought. Joelle (shown here with Dr. Martin) is an exceptional teacher. She delivers material succinctly at the correct level, waits patiently for us to think through a problem and reacts promptly when action is required. We feel very grateful to her. 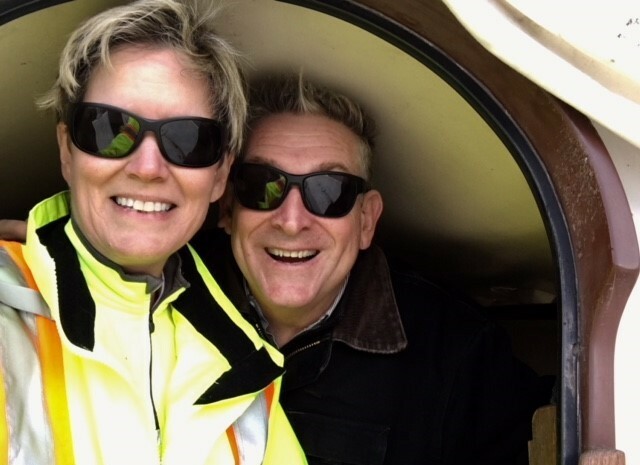 And her partner, Steve Crisp, wrote: Before this year I have never sailed or wished to in my life (53). 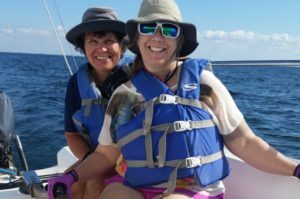 I had sailed 4 times previous and was not sure if sailing was for me. Having taken this course I am now confident and excited to get home and start sailing. Joelle was an exceptional instructor with patience when needed and the firmness to make maneuvers sink in when needed. 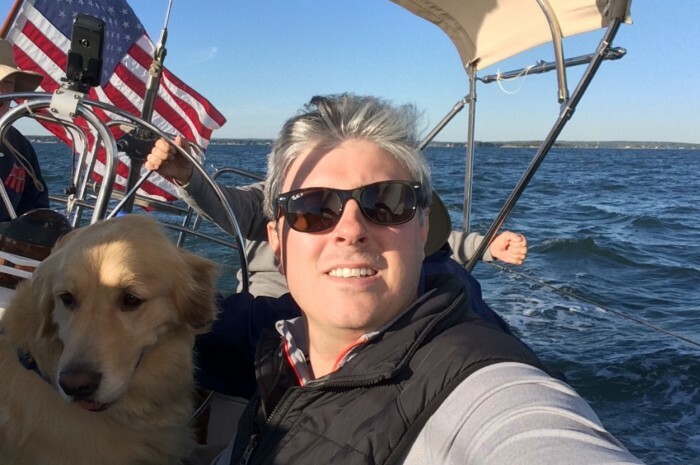 We just recently purchased a sailboat and I needed to refresh and quickly improve my meager sailing skills. 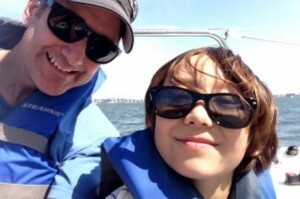 “Learning as I go” was not a practical option on a 35’ sailboat with a couple of kids on board in New York Harbor. 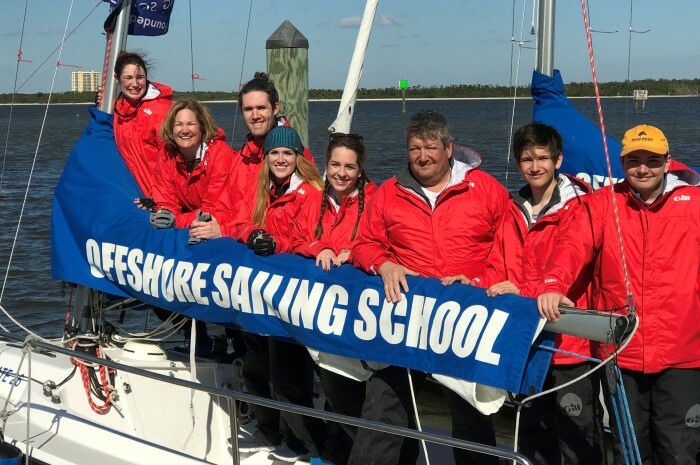 When I researched schools on the internet, I was impressed with all the positive feedback and large selection of learning opportunities that Offshore Sailing offered. It was REALLY important to me that the wife and kids were going to have a good time and become proficient at sailing since they are going to be my main crew! Part of the reason I chose Scrub Island was the lack of distractions and its renowned sailing environment. The resort was beautiful. The accommodations were excellent. I was a little concerned with a 10 and 12-year-old keeping up and being eager participants for five consecutive days. However, our instructor kept them both fully engaged and had tremendous patience on and off the water with each of them. He really made it a great learning experience and memorable week for all of us. Even my wife (a landlubber from West Virginia) said, “I would never have thought of doing this but I really enjoyed it and glad we came!” Hallelujah! The 5-day Basic Sailing course was a total immersion experience – classroom, on the water, quizzes, and evening prep for next day. Exactly what I wanted. I know enough after this week to decide if a sailboat is in my future. Randon was excellent. 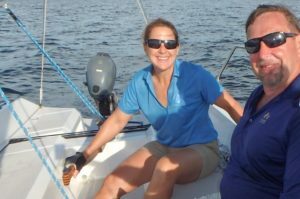 Knowledgeable, patient (with 2 older women as students), organized/efficient, and calm on the water. We were out in heavy winds and he kept it all under control. 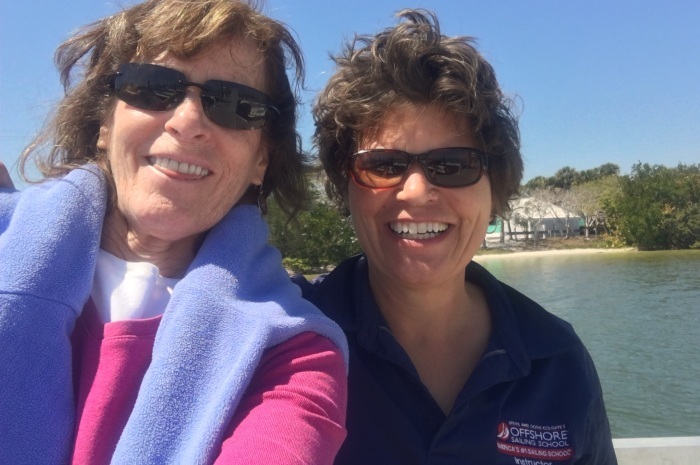 And Diane Beecher, who took the course with her, wrote: I am a novice sailor and the 5-day Offshore Sailing School certification course offered me a fine balance of theory and practice. What a thrill to sail for five days, on the Gulf of Mexico and Pine Island Sound in beautiful Captiva! 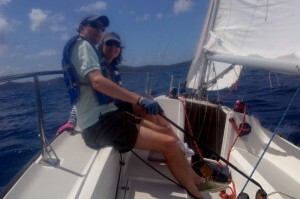 I valued Randon’s professional, friendly, encouraging, approach to sailing instruction. He style was just what I needed in a teacher. Beth Kaufman wrote: The experience exceeded my overall expectations!! I learned so much in a short time. The instructor was knowledgeable, personable, kind and patient. Totally enjoyed the course! 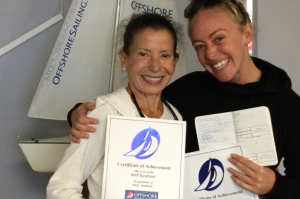 And Shaina Miller added: As a new sailor – this course and our instructor were perfect. 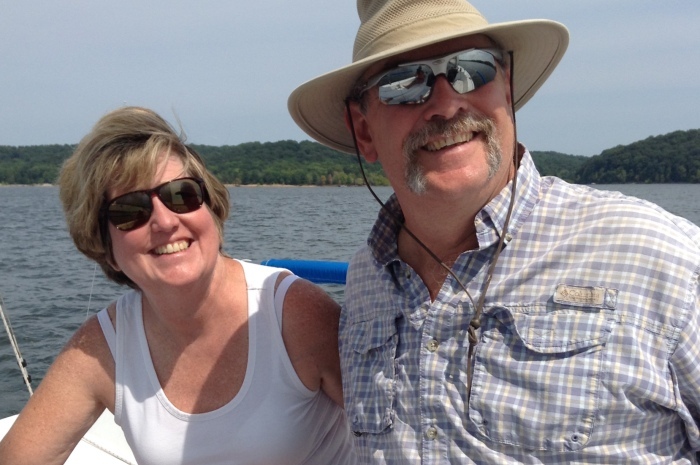 Suzy was everything we were hoping for – an expert, kind, easy going, and a joy to be with. What a fabulous experience into the sailing community. A top notch sailing school that combines the academic side of sailing with the practical experience of a professional team. It was everything I hoped for and more!! 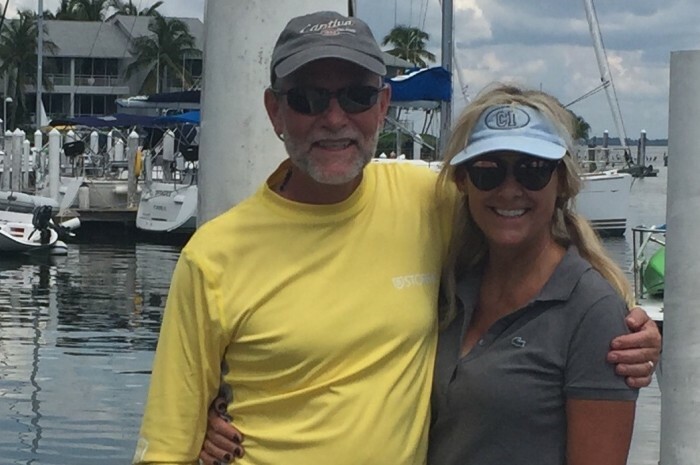 Mike Dewane is a great asset to Offshore Sailing. Colgate is lucky to have him as an instructor. 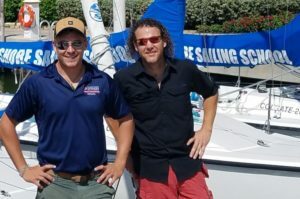 His experience, insight, enthusiasm to teach sailing is palpable. He loves what he does and clearly is passionate about the sport of sailing. Moreover, he goes above and beyond to ensure his students walk with a positive experience. Thank you Mike!!!. And Paul wrote: I am a college professor with many years of teaching experience and have had a number of formal courses in education. Mike excels as a teacher and easily is as effective as most college professors. 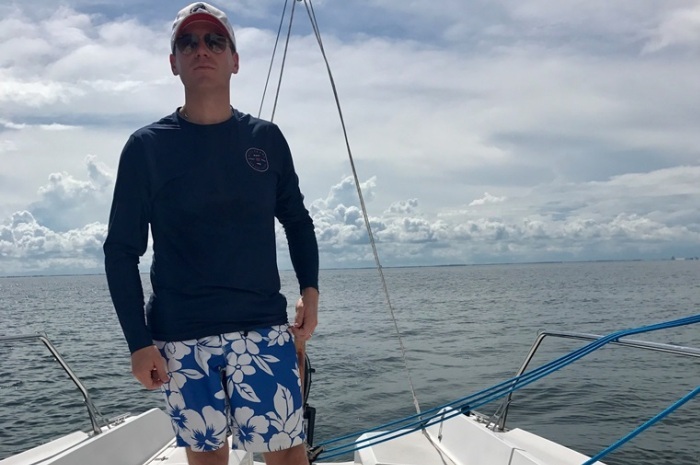 He is patient, creative in creating educational analogies and appears to love what he does and the profession of sailing. He is unusually knowledgeable and very professional. Exceeded my expectations! I am a novice sailor and prior to this course sailed in Boston Harbor on a Rhodes 19. The ease of handling a Colgate 26 was amazing. Highly responsive and well balanced – beautiful boat! 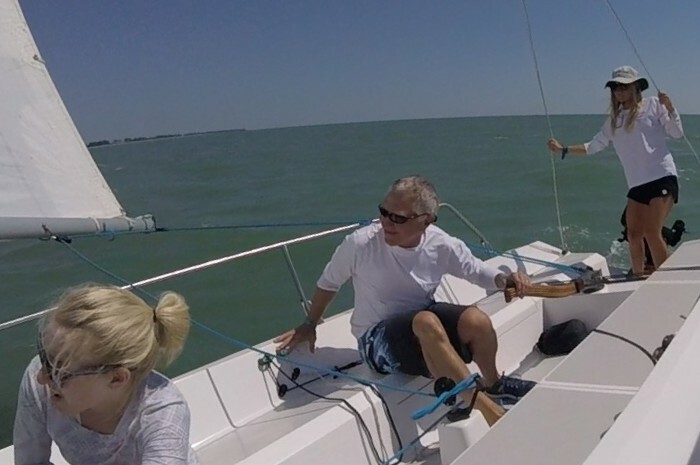 The course was conceptual and greatly boosted sailing confidence – Thank you! Randon was very attentive to the individual needs. He was great at answering questions and building on skills day by day. Classroom learning clearly translated to on water learning. At first I was apprehensive about learning on the boat in front of the instructor and students. However, that quickly went away and I had an amazing experience. I cannot wait to use the knowledge and skills I learned in our own boat. I also cannot wait to sign up for the bareboat cruising course so we can charter our own boat in the Caribbean. Our instructor was full of expert knowledge, very patient and made me feel at ease with every new experience. He also answered all our questions even when we asked more than once, related the learning to real-life examples, and helped us understand how to apply the knowledge to our own boat. Her partner, Bruce Diggett, commented: Having owned my own sailboat for a year and a half it was amazing how much I learned in such a short period. It will certainly improve my skills and confidence when I return home. Very pleased with our OSS experience and already recommending to others. We do plan to move on to the next stage with OSS and take the cruising course while living aboard a monohull. That may be a couple of years out yet, but we will be doing it. Thank you for being flexible with our wedding day, too, and for allowing photos in the Colgate 26 to mark our event. Very special. Thank you! 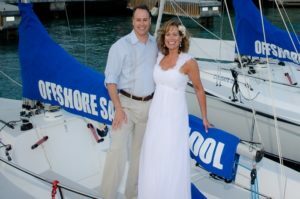 Brian was a very patient and CALM individual and that clearly was a necessity with my rather high strung and excitable fellow student – my now husband, Jay!! Brian made sure that we both learned everything we needed to and that each of us had ample opportunity to master the things we needed to. High mark for Brian and we appreciated his time and effort. As a lifelong boater and casual sailor, I was concerned the 5-day LTS course might be too basic. Wrong! We learned nuances of sailing that opened up an entire new world of enjoyment! 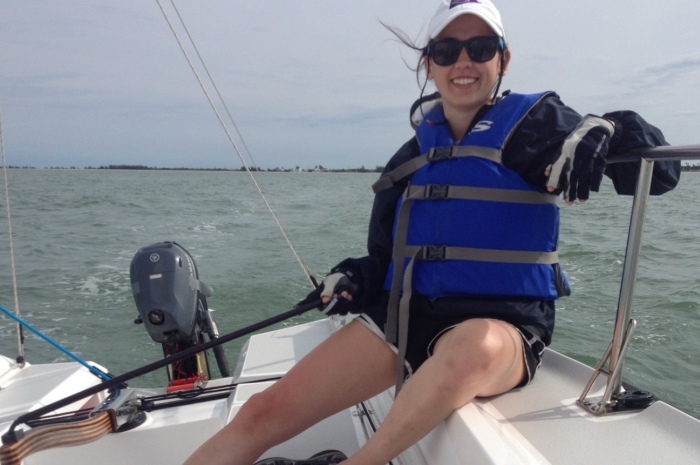 And my daughter (that’s her in the photo) went from complete newbie to top sailing student – that was fun to watch! Joelle is a fantastic instructor, patient, knowledgeable, thorough and completely capable. By week’s end, my daughter and I felt completely ready to sail! P.S. Colgate 26 = Amazing boat. We are newly married – I had taken this course before. She wanted to know more about sailing and me teaching her did not seem like a great idea. We agreed to take this class together. We both gained knowledge but learning to sail as a team was the best result!!! Don was exactly what we needed from an instructor. He understood our goals and helped us achieve them!! Here’s what Kahy had to say: I learned everything I came to learn and so much more. I feel so much more confident in handling the boat and FINALLY understand the sailing terminology my husband uses. This is bound to make our future sailing trips together much more harmonious! 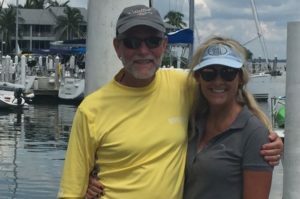 Don is extremely knowledgeable not only about all aspects of sailing but also about the Colgate 26 (which was good for us since we own one!). We learned so much and appreciate his advice, patience and guidance. He was fabulous. I was ambivalent about the idea of a sailing course, but agreed to it as a recreational way to spend time with my husband, brother and sister-in-law. It was more fun than I could have imagined. I now anticipate joining them for sailing and perhaps more courses in the future. Our instructor was the consummate professional, of course, skilled and knowledgeable, but also kind, patient, and encouraging. He is gifted in that he can explain difficult concepts to those who have no sailing experience without making him/her feel like an idiot. Well pleased with our experience. Everything about our overall experience was excellent . . . sailing advisor, reservations, accommodations, classroom, Colgate 26. Instructor was perfect. Very knowledgeable, patient, experienced, professional, courteous and professional. I wouldn’t change a thing. We had a great time and learned a boat load . . . pun intended. Thank you. 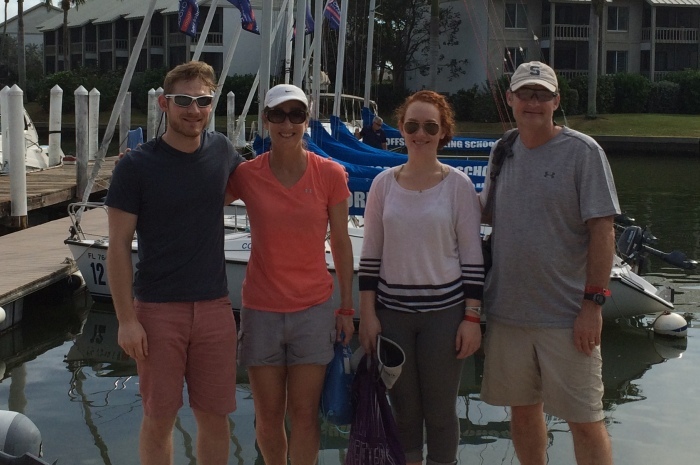 We undertook the 5-day course as a Family Adventure vacation. 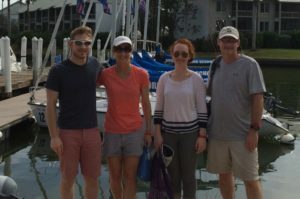 We had various levels of sailing skill and comfort, but the course provided an exceptional learning experience for each of us, and increased the comfort and skills of all of us. Rick was an exceptional instructor both on the boat and in the class. He provided us with fabulous group and individual instruction. This was perfect for each of us. 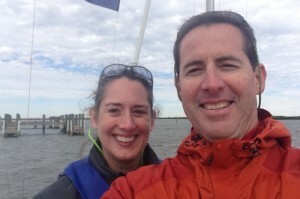 We just completed the Learn to Sail course. This was one fantastic adventure. My husband is very content with playing golf each weekend/day. I surprised him with our sailing course. He had so much fun and it shook him out of his routine! 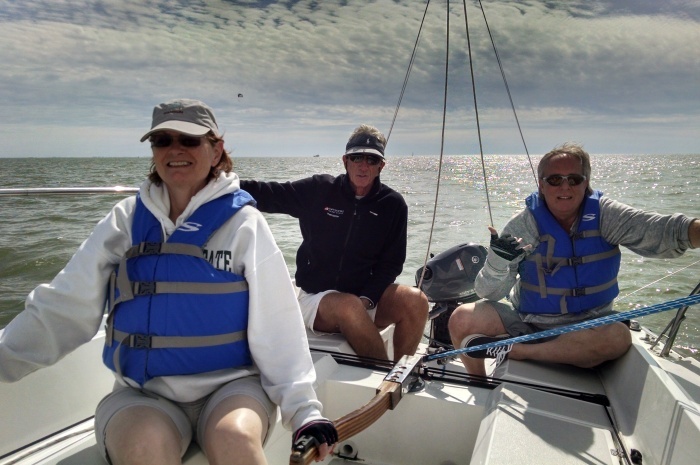 Our instructor, Steve, is such an accomplished sailor and knew how to impart his knowledge to us novices! We will be back again, and will recommend to our friends. Thank you for such a great “bonding” experience. We had a great time! The first day was a little rough because of winds but it was great to get our feet wet. By the third day we were all very comfortable performing any of the tacks. Sailing will definitely e a lifelong thing for Luke and me. Jack was very laid back and let us figure out what worked for us! He is extremely knowledgeable and I would recommend this course and Jack to my friends. I have been landlocked my whole life. Our instructor was working with someone with no knowledge or experience. Everything he taught me will be so valuable as I start to sail! He took so much time on the water and in the classroom with me. I went from not liking sailing to really loving it. My only other experience was a few weeks before the class and it was not a good one for me. Now I love it! The course met and exceeded my expectations. 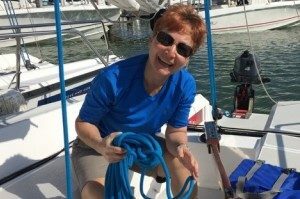 As a novice sailor who had sailed a few times, my goal was to gain knowledge and experience to allow me to sail my 24′ sloop with confidence this coming season. I now have this confidence and can’t wait to get back on the water. Our instructor had vast experience as a sailor. He was able to share his knowledge in an easy going and patient way. The course was amazing in providingf a unique learning experience for myself and my wife to share a new hobby. We plan on buying a boat in a year or so. Brian was awesome and definitely patient. We learned a lot and feel confident on the water. Thanks for his position instruction and leadership. Lauren had an excellent time! 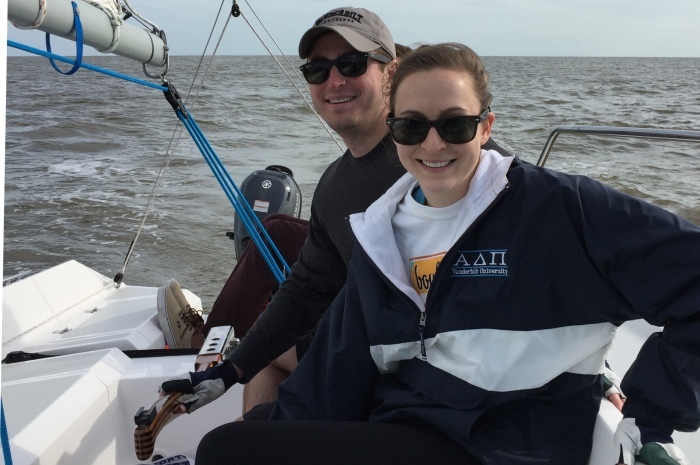 She learned so much and feels like she’s well on her way to being a confident sailor, too. This started as a gift for my husband who wanted to learn to sail. But after joining the class I was just as excited and addicted as him. Thank you for a wonderful experience. 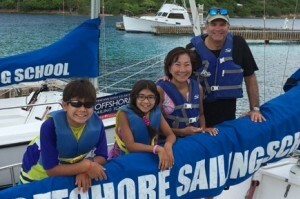 Offshore Sailing School made learning to sail fun and rewarding. We left the school with a new confident feeling and a strong desire to continue to sail. This was a great week, worth every cent! Joelle was amazing. Could not have learned as much as I did without her. She was extremely knowledgeable and PATIENT. Highly recommend her to anyone who wants to learn. Rick did an outstanding job teaching & training. Mostly I appreciated his patience and sincere interest in our success. It was a challenge, but a great deal of fun. I learned what I hoped to learn and my confidence will allow me to practice and get better. Well worth the time and money. 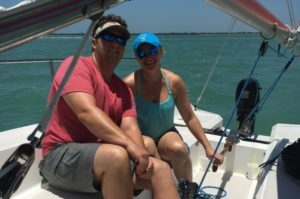 I was a little apprehensive about the course, as I had no prior sailing experience, but our instructor (Amanda) immediately set my mind at ease. She was incredibly patient and knowledgeable, and made our classroom and on-water sessions fun! Her enthusiasm and love of sailing was contagious, and I enjoyed every minute of my experience. Now that I’ve completed the Learn to Sail course, I can’t wait to participate in a cruising course! Great experience! 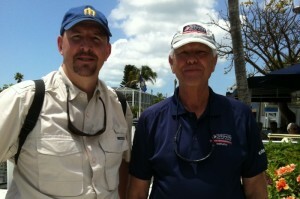 Bob Easterly is a great instructor with amazing experience, great local knowledge and a navy captain to boot! I’d sail with him anytime! 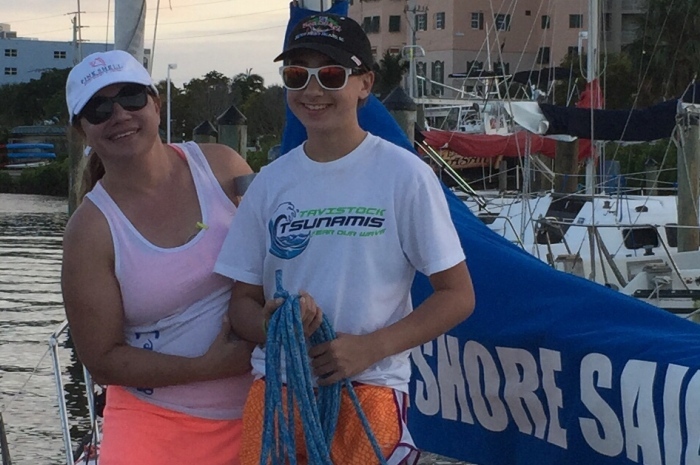 Everything was at or above expectations, and demonstrates excellent operations, from boats and equipment upkeep, to how in classroom translates to on the water instruction. This course works and is 100% connected. This is really a top-notch, customer/student oriented business. Shane was amazing – Energetic, patient, very knowledgeable and able to articulate everything very clear. Excellent time. 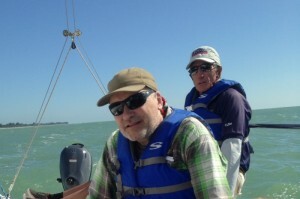 I understand the keelboat very well now (since coming from a few years sailing dinghies) – would recommend to anyone! Instructors Bart and Shane – excellent knowledge, able to pass it to others, patient and fearless! Took three days to wipe the grin off my face. Bart was an absolute professional sailing instructor. He was calm and patient on the water and in the classroom. These were essential qualities for us, as a group, as we were comprised of myself and a friend and our 10 year old sons. Thanks to Bart, we all passed the test and enjoyed ourselves a lot! I was apprehensive when booking the course because I thought 3 full days of sailing instruction (or any instruction) would be challenging for my 10 year old. 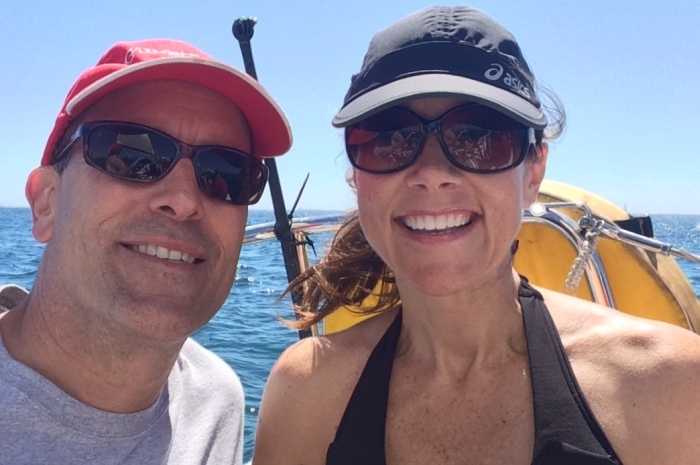 The reality was that we had a great time and look forward to sailing together this summer! Kat was wonderful. She was very knowledgeable and patient with our many questions and occasional “block” to understanding a concept. Kat would take the time to use the boat model or white board to explain. On the water she made us feel comfortable and confident. 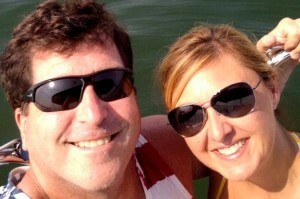 We are anxious to get out on the water again. From Karen’s husband, Chris Gackstatter: Our experience was unique in the fact that we did the Fox News segment with Steve Colgate. Kat did not miss a beat and we never felt that our instruction was compromised. 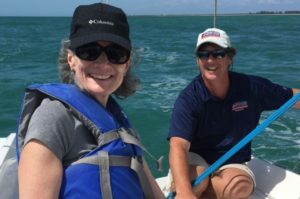 Learning with Kat was more like sailing with a friend than being a customer. 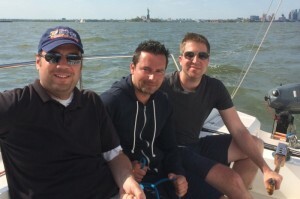 We loved doing the 5-day Learn to Sail course out of NYC. We feel we can sail in any harbor in the world; and after sailing classes there was NYC to entertain us. 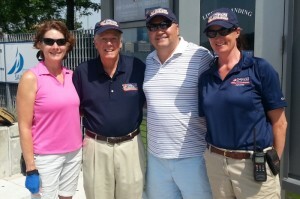 The sales force did an excellent job in making the course happen at the Manhattan location.